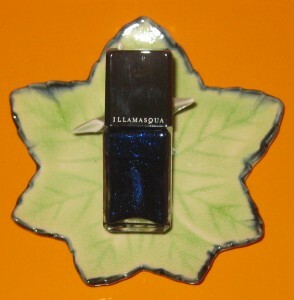 Illamasqua Phallic Nail Varnish review and photos. 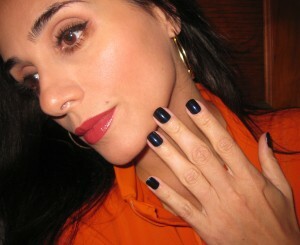 Absolutely stunning “deep midnight blue with shimmers” (Sephora’s description). Formula has a substantial medium consistency. Opacity is reached with one coat. I apply two coats for good measure. Phenomenal wear…5-6 days without chipping, especially if paired with Illamasqua Base Coat. The blue shimmers in the polish make Phallic appear noticeably blue rather than black. Large selection of shades and finishes…49 to be exact. Price/amount ratio will not break the bank…IMHO the formula surpass Chanel and Dior. The brush head is dense and tapered perfectly to accommodate a variety of nail beds. The polish dries quickly–very similar to Marc Jacobs nail lacquer (reviewed here). Permanent color in their line. The names of certain polishes are quite risqué. (ex: phallic, load, blow, throb…you get the point). The formula is not advertised as 3-free (formaldehyde resin is an ingredient, but most polishes have this chemical in their formula to provide shine–not part of the 3-free category). Removal is a pain in the keister….Zoya Polish Remover is the only remover that will eliminate all traces of this blue pigment. Staining is a definite if a base coat is not used. As of late, Sephora no longer carries the entire line in stores..certain items have been cut from their in-store stock. Illamasqua Cosmetics are sold at Sephora, sephora.com (entire line) and bloomingdales.com (entire line). Illamasqua Phallic Nail Varnish ingredient list. Makeup would tell you Illamasqua Phallic is one deliciously naughty nail color. I am on my second bottle..that is how much I adore this color!!! Phallic’s color, wear, shine, consistency, and brush head is worth the aggravation of the removal. A drugstore duplicate is sure to exist, however I do not have the energy or desire to seek out its doppelgänger. Illamasqua is a great brand (Ore Pigment anyone (here), if you can get past some of the names of the products and over-the-top makeup images. Personally, I find the images to be a work of art, but some traditionalist may not agree and overlook this brand. Remember, sometimes it is wise to let go of convention, let your hair down and let some of your alter ego shine through 🙂 Be well and stay safe.